Gay rights activists are outraged over Apple's recent approval of an iPhone application created by a religious group advocating "freedom from homosexuality through the power of Jesus Christ." The group, called Exodus International, believes homosexuality is essentially an affliction to be treated through religious methods. "[Exodus International] uses scare tactics, misinformation, stereotypes and distortions of LGBT life to recruit clients," according to Truth Wins Out, a gay rights organization. TWO has recently started a petition on Change.org asking Apple to remove the app from iTunes. At the time of this writing the petition had just over 80,000 signatures. 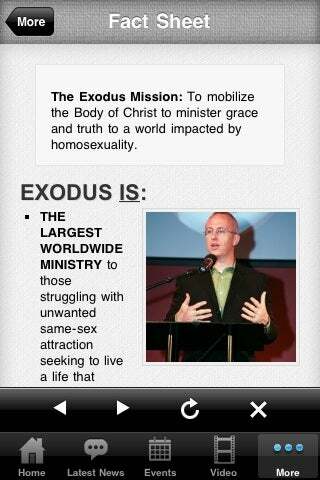 Of particular concern to the group Truth Wins Out is Exodus International's attempt to appeal to young people. 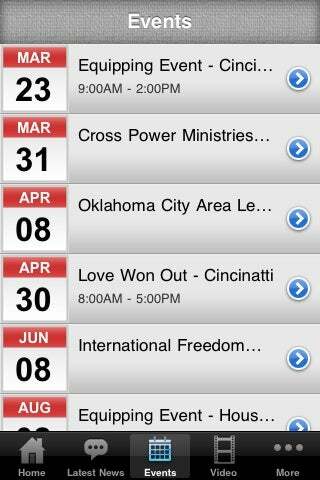 "This new iPhone app is the latest move in Exodus' dangerous new strategy of targeting youth. In light of the recent wave of LGBT youth suicides, this tactic is particularly galling as it creates, legitimizes, and fuels the ostracism of LGBT youth by their families," TWO says in the preamble to its petition. Both the American Medical Association and the American Psychological Association reject the idea that homosexuality is a condition requiring therapy or treatment. This is not the first time Apple has approved an app that opposes homosexuality. In December, The Manhattan Declaration, a group that equates homosexuality with "immoral conduct," briefly had an iPhone application on the App Store. Apple removed the Manhattan Declaration's app after nearly 8000 people signed a petition on Change.org. At the time, Apple said it removed the app, because it was "offensive to large groups of people." Despite Apple's apparent willingness to allow applications opposing homosexuality on the App Store, the company itself has a record of supporting gay rights. Apple donated $100,000 to defeat proposition 8, a ballot measure to ban gay marriage put before California voters in November 2008. Proposition 8 was successfully approved by California voters, but was overturned in August. The fate of gay marriage in California is still unclear.